Q: Should my child want to learn piano or can I make him/her take lessons and hope the interest will grow? 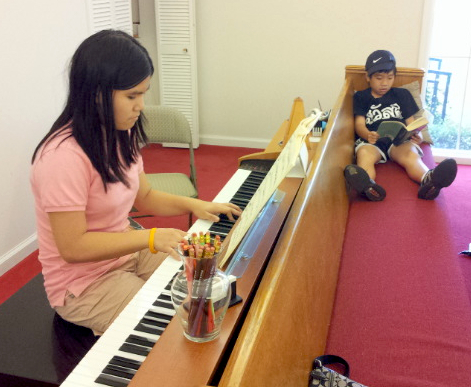 A: A child who is made to take piano (or any instrument) will likely not practice on his own. Unless you have discussed lessons with your child and he/she is excited about the idea, it's probably best to let them develop their own interests. Q: Must I own a piano to take keyboard lessons? A: You must have access to a practice instrument. Just as in learning a foreign language, repetition is the key to learning in music. Our weekly lesson is your opportunity to demonstrate the work done at home. Lesson time is NOT practice time! Without a commitment to practice, progress and enjoyment will elude you. A: Many of my students have electric keyboards. It's best to buy one with weighted, touch-sensitive keys, like this 88-key Casio Privia played by Benya (at right). I also strongly recommend models with at least 5 octaves (61 notes) and a jack for a sustain pedal attachment. Check here for my keyboard shopping tips. A: Single student rate is $26.00 per half hour ($30 at Parks), payable monthly in advance. See my Rates page for full information and payment options. Q: When and where do you teach? A: Saturday through Tuesday at Holy Cross Anglican Church on Hwy 96 in Franklin, Wednesday during the school year at The Classical Academy of Franklin on Del Rio Pike, Thursday at the Brentwood Indoor Sports Complex off Concord Road and Friday at the Franklin Recreation Center off Hillsboro Road. Call me for openings. Q: How often do I have to practice? A: Regular practice is the cornerstone of progress. Beginners should practice their assigned lesson material 5 days a week, 15 minutes per session. By the time the student reaches Level 1 of the Faber method, he/she should allot 30 minutes a day. Each piece needs to be repeated several times daily. Q: How young should a child begin? A: I recommend they have some socialization like preschool or kindergarten before starting lessons. The child should have some concept of the student-teacher relationship, and that they will be asked to practice during the week. 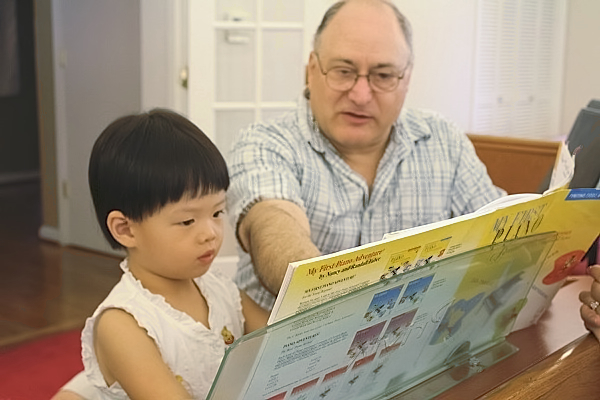 Age 4 is the youngest I start children in piano, using a fun pre-reading method. If your child is a prodigy, like Helen at age 3 (shown at left), I'll make an exception. Q: Do you take transfer students? A: Yes, but from experience, most transfers need to back up a level or two for review and to fill in any gaps in their education. Q: What if I don't like lessons or can't get my child to practice? A: There are no contracts. You may stop at any time, but proper notice (2 weeks) is requested so I may fill your spot. If you quit mid-month, there will be no refund of tuition paid for the month, so it makes sense to finish out the remainder of the month. Q: How do I know you are a safe person to leave my child with? A: Firstly, parents are more than welcome to sit in during lessons, just like Maddie shown here with her mom. Secondly, as a parent of two kids, I am very conscientious about protecting your child's well-being and maintaining appropriate space...although I won't say no to a hug! Thirdly, my background checks are on file with the TBI (Tennessee Bureau of Investigation), performed while in substitute teacher training for the Franklin Special School District, and the Williamson County Sheriff's Department, performed as a pre-requisite for employment with Parks & Recreation. 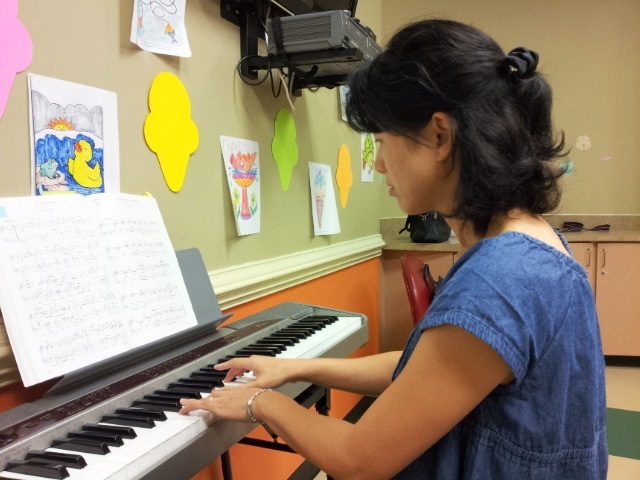 Q: Do you participate in Piano Teachers Guild "auditions"? A: No, I'm not involved in any juried or competitive events. Q: Can I learn to play by ear? A: Playing by ear is an aptitude. I can guide you if you possess the gift, but I can't give you the gift. Q: Can you teach me jazz? A: Yes, but it will be method-based with a solid theory foundation. Jazz is not free form; it is highly structured. Q: Can I learn to play in a short time? A: Absolutely not! Music is a language and playing an instrument is a physical skill. You wouldn't expect to be proficient in German or ballet after just one year of study. A: Yes, such as Hiroko shown at left. However, working adults often discover they can't find practice time. 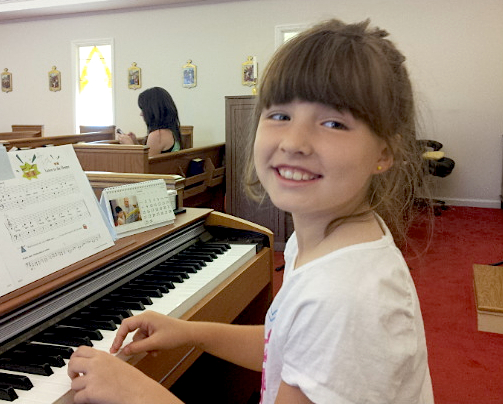 Studies show it's also harder to learn music if one hasn't had a foundation during childhood. I ask prospective adult students to seriously weigh these two factors before beginning lessons. It may spare you disappointment down the road. Q: If my question isn't answered here, is it okay to email or call you?